Fitment:1936-'69 HD® big twin Features& Benefits: Same width oil supply and return gears as the stock HD® aluminum pump. S&S® pinion and oil pump drive shaft drive gears increase potential oil volume delivery by 25% over stock on 1972 and earlier engines. S&S® pumps for 1936-'67 engines used with the S&S® oil pump drive gears deliver 33% more oil than the original cast iron pump. Machined with an oil pressure relief bleed off passageway- relieves pressure build up on top of the valve to maintain consistent oil pressure. Oil pressure regulation bypass routes excess oil directly to the supply side of the pump & reduces the amount of oil returned to the tank, less foaming and cavitation. The standard pump cover allows total flexibility for oil system configuration with a number of oil feed and return options. *Requires 1973-'77 breather gear. **Uses a 28 lb pop-off spring to lower oil pressure at high RPM. § Universal cover with top and bottom oil feeds.+Engines for 1936-’64 chassis with tin primary must use a 1954-’64 style inner primary cover. S&S Super Stock generator style crankcases are available for stock 37/16" or 35/8" bore, but can be special ordered for bore sizes up to 313/16" and deck heights as much as 3/16" taller than stock. A special order sheet must be filled out for any special order crankcases. Ask your S&S Customer Support Representative or download special order forms from our website at www.sscycle.com/soforms 1936-’54 must use the 1955-’64 style inner steel primary cover. Since all S&S generator style crankcases use 1958 and later style main bearings, stock flywheel assemblies 1957 and earlier cannot be used in S&S crankcases. Flywheel assemblies must have 1958 and later pinion shaft with 1.250" diameter bearing, and a 1954 and later style sprocket shaft designed for a Timken® main bearing. Generator style cases for 1936-’47 knucklehead engines are machined to supply oil to the heads from a boss located near the rear tappet guide or from a stock or S&S gearcover. Provision for oil scavenging from the heads in these crankcases is the same as stock, with passageways that connect the tappet guides to the crankcase breather gear. 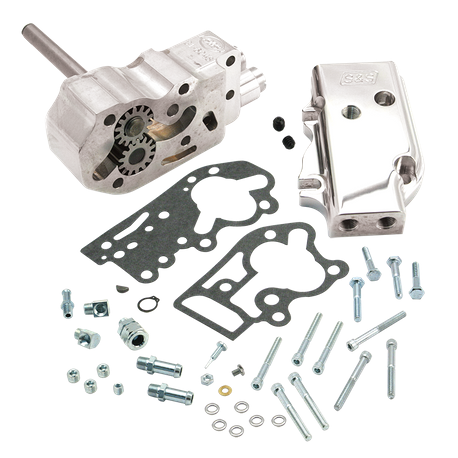 Crankcases for 1948-’69 engines are machined with a provision to separate the oil supply to the top and bottom ends if an S&S oil pump is used. This feature lets you choose the 1972 and earlier stock "side oiling" system or the 1973 and later split oil system. The stock cast iron oil pump can be used for the "original look" and stock oiling system. If an S&S billet oil pump, part #31-6200 is used, the oiling system can be set-up as stock or updated to a split system. 1963-’65 panhead engines, with outside oil supply lines to the cylinder heads, must use the oil supply port located behind the rear tappet guide or the oil fitting toward the rear of the S&S gearcover. S&S generator style crankcases do not have the stock style "outside oiler" oil supply boss, so special oil supply lines will need to be fabricated.